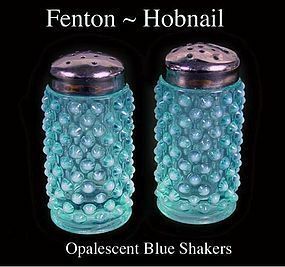 You are buying a pair of harder to find Fenton Blue Opalescent Hobnail Shakers. They are in very nice condition with no damage or repairs. They 3 1/8 inches tall. There is a ding in one of the metal tops. 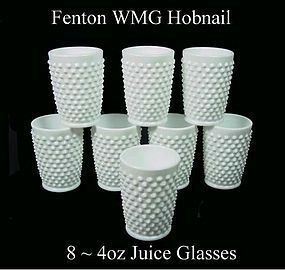 These 8 Fenton white milk glass 4 ounce juice glasses are in excellent condition! 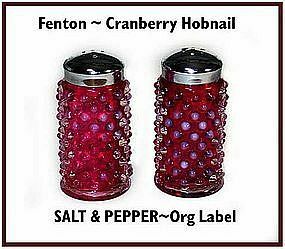 They are not marked but are undeniably Fenton. Nice! There are 8 tumblers in this set, all for 1 money. 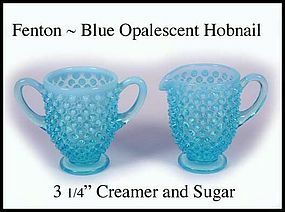 This blue opalescent hobnail creamer and sugar sent were made by Fenton in the 1950's. They are both in excellent condition! 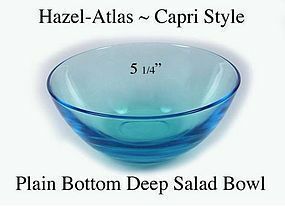 This Capri deep salad bowls are hard to find, and these are in excellent condition. The size is on the photo. 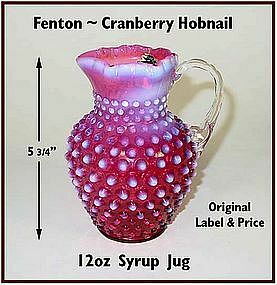 These are the dot bottom version, not the plain ones with the plain bottom. 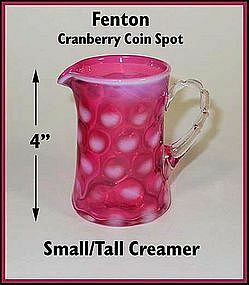 There are 2 bowls available @ $12.00 each. 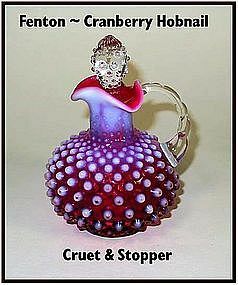 This blue opalescent hobnail creamer and sugar sent were made by Fenton in the 1960's. They are both in excellent condition! 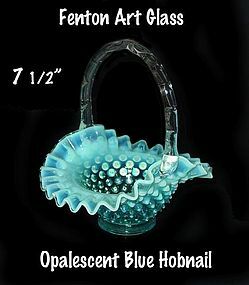 This Fenton blue opalescent hobnail 7" basket was only made from 1940-1955. It is in excellent condition and a most beautiful color! 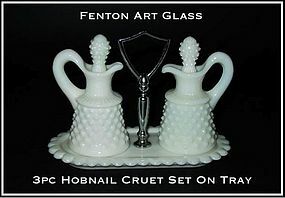 This Fenton white milk glass 3 pc cruet set is in excellent condition. The set has 2 cruets with stoppers, and a white milk glass tray with a chrome metal handle. 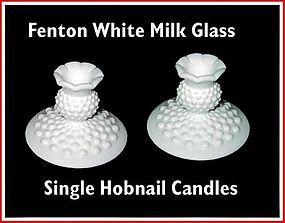 These 3 1/4" tall WMG Fenton Hobnail ruffled top candles are much prettier in person than in the photo. They are unsigned and in excellent condition.